This concrete grinding business recommendation is the best combination of tools for concrete grinding that will result in maximum performance and flexibility for minimum cost. small coatings applicators who are just starting up and need the concrete grinding tools to effectively prepare concrete floors without having to purchase expensive grinding equipment and large vacuum dust collectors. The Situp Grinder kit above mounted on a 9 in, 230mm angle grinder is a powerful, low-cost concrete grinder and edger capable of economically completing 200 sq.m. (2,000 sq.ft.) jobs while the five inch dust extraction shroud below will take care of all small areas and into the corners. The steel construction of this equipment and the low capital cost make them an ideal pair as the perfect starter kit. Rental companies hire general purpose equipment which will not be flexible enough for you to use for a business. The main reason hire/rental is not a good option is that you need to make money and hire/rental equipment very rarely helps you to achieve this outcome because of high costs and inflexibility with diamond tooling. Hire equipment normally have the wrong diamonds fitted which maximizes their life so it will be economical for the hire company, but those diamond tools will take too long to complete many jobs. You need the flexibility of choice so you can use the most effective tooling for the job. Floor preparation contractors are expensive for small jobs and they are not always available to do the job when you need it done which is critical. You run a risk of finding this out the painful way if you choose this direction. Sometimes they are just booked out when you want your work done because peak times for you are often peak times for everyone else. They are also very expensive for smaller jobs which means you will miss out on many quotes that have cost you plenty in advertising and time. The answer is to have your own equipment for small floors up to 200 sq.m’s (2,000 sq.ft) and for the edges while you subcontract out the jobs where large area diamond grinding is required. It is more economical for big floor areas to hire in contractors who have invested in larger equipment. In time you will be financial enough to purchase your own, but in the meantime all you need is a small floor grinder & floor edger plus perhaps a polisher. The five inch concrete grinder with steel Cornerhood above will complete all the small areas like bathrooms, while the Situp Grinder above will grind floors quickly up to 40 sq.m./hr (400 sq.ft./hr) and do the edges of all large floors. With these two tools you can run a very successful concrete grinding business and if you expand just buy another combination of them for a second employee to use before you purchase large equipment. The big boys hate to do little polishing jobs, but now you can do them with the Situp Polisher which will cost you very little to get started. You will need the Situp Polisher kit plus weights, chair and 180mm variable speed polisher plus some diamond tooling, adhesive for filling in the small holes, lithium hardener and resin pads. 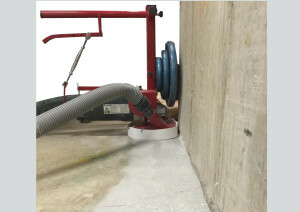 There are many processes with floor polishing which are explained at this Guide to DIY concrete polishing, but using a Situp Polisher will vary slightly in the steps and tooling. People want to rip out tiles and polish the concrete in bathrooms and on balconies for a softer, more natural and low maintenance floor finish. Entrance areas are also a perfect spot for polishing. Many tradesmen such as tilers, vinyl layers, concrete overlay applicators and painters need concrete grinding completed while very few have the equipment which opens up opportunities for new business. When starting a new concrete grinding business you need to make contact with as many of them as possible in your area and explain the advantages. Below is a list of the most common benefits. – Tile grouting relies on adhesion to the floor which can only be achieved by concrete grinding it first. Rework jobs require the old grouting or glue to be removed which is achieved quickly by diamond grinding. It is easier and less costly to grind down the high spots in a floor than to apply thick leveling compounds to build up the low areas and dustless grinding with the above tools is clean so it can be done inside homes, or rooms without causing a mess, or on site without problems for other trades. – Vinyl is normally glued to the floor like tiles above so most of the points above apply to vinyl layers too. An excellent tool for glue removal is the Tearitoff. Wood floor layers – The same as above, or for removing high trowel mark peaks to lessen the amount of self leveling compound required. 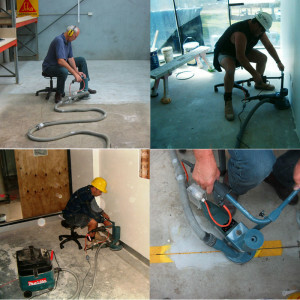 Builders – There are many applications for concrete grinding to be done on construction sites especially refurbishments. New slabs have to sit level with old concrete which often need grinding to make them level. Spills of paint, plaster, concrete and general grime on floors need to be cleaned up at the end of a job before laying floor finishes or handing over the building to the new occupants. Coating contractors and overlay applicators – There are many of these small businesses who are unable to afford grinding equipment and rely mainly on acid etching. They spend far too long on removing paint and other contaminants that the acid will not affect and they cannot afford to hire a large grinding contractor to do it for them. First look up all contractors in your area who advertise in directories or papers. Ring them one by one and send them a flyer. Look up every category that may contain the above trades. Next search over the internet for the same trades and ring them too. After that look for places where these people buy their supplies and ask if you can leave some cards on the counter at each of these suppliers. Using photos of every type of job regularly send updates in the form of a flyer or newsletter to each business you have contacted. Direct mail through the post is excellent, email is also effective if you have the right person’s email. 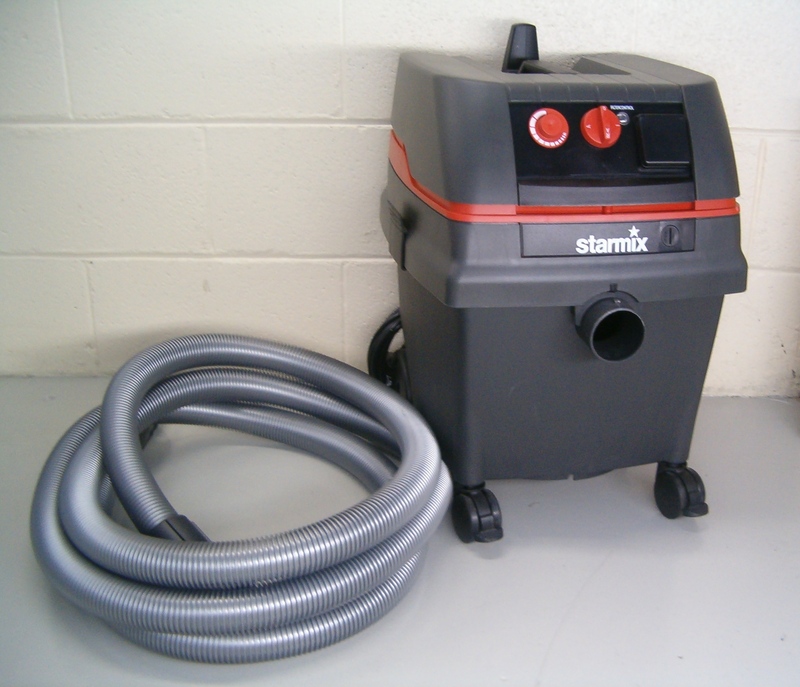 You will need to own a very good vacuum dust collector like the one below which is powerful and small with self-cleaning filters that vibrate to remove the concrete dust. 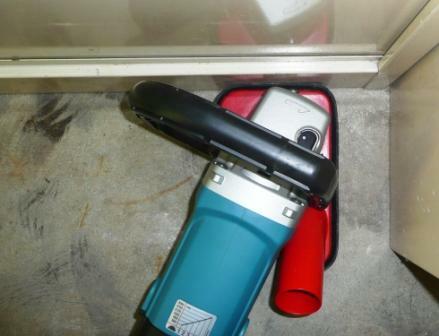 The vacuum pictured is made by Starmix and sold under various names such as Metabo, Bosch, Eibenstock, Milwaukee, Ermator and others. Do not choose a vacuum that has less than 35mm (11/2in) diameter hose. There are many other dust collectors available including Alto (Nilfisk) which has continuous self-cleaning filters and others sold by specialist diamond tool distributors. Beware of models that require the use of paper bags because of the expense of these replacement bags. 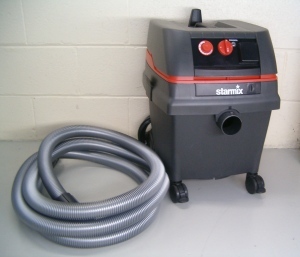 Also avoid vacuums that rely on a felt filter bag to remove the dust because these typically will clog within 5 minutes and take 10 minutes to remove and clean unless they are specifically designed with a self-cleaning function, however these should be avoided if you want to run an efficient concrete grinding business. Always dispose of concrete dust responsibly according to local laws and safety requirements. One way to do this is to cover the base of the vacuum dust collector with a plastic bag when you empty it to enclose all the dust, or to line your dust collection base with a plastic bag so that you simply close it before emptying. 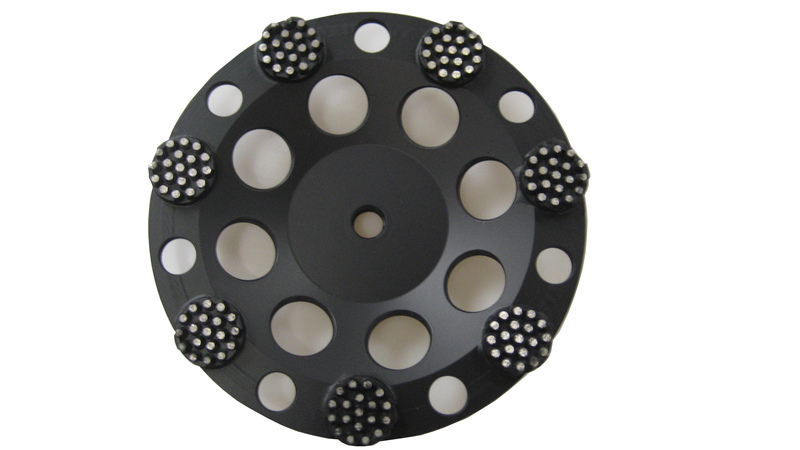 Every concrete grinding business will require a range of cupwheels to complete most jobs reliably and on time. 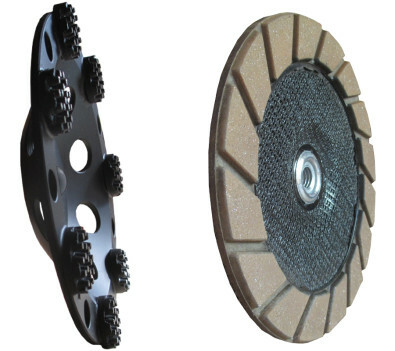 Concrete varies in hardness according to the mix that was specified originally and you need to have at least one cupwheel for hard concrete and one for softer concrete. See Grinding Hard Concrete for more information. This is applicable to both the 5″ edge grinder and the 7″ Situp N Grind. Fortunately we now have Tearitoff wheels that take the guesswork out of choosing the right wheel. This equipment will fit into the luggage area of most family cars so it is not necessary to purchase a separate vehicle. It is all able to be carried by hand in and out of the car, to and from the job, up and down stairs or in lifts. It will operate from domestic power outlets, both the vacuum dust collector and grinder can operate from the same outlet. Without the Situp kits to attach to your grinders it would not be economical to begin a concrete grinding business or polishing business because of the fatigue associated with kneeling to grind and using your body pressure instead of weights to help the cutting process. Apart from the extra physical effort all your body weight on your hands and knees is dangerous to your health and restricts mobility. Placing your body weight on a mobile chair that moves with very little effort is far better.